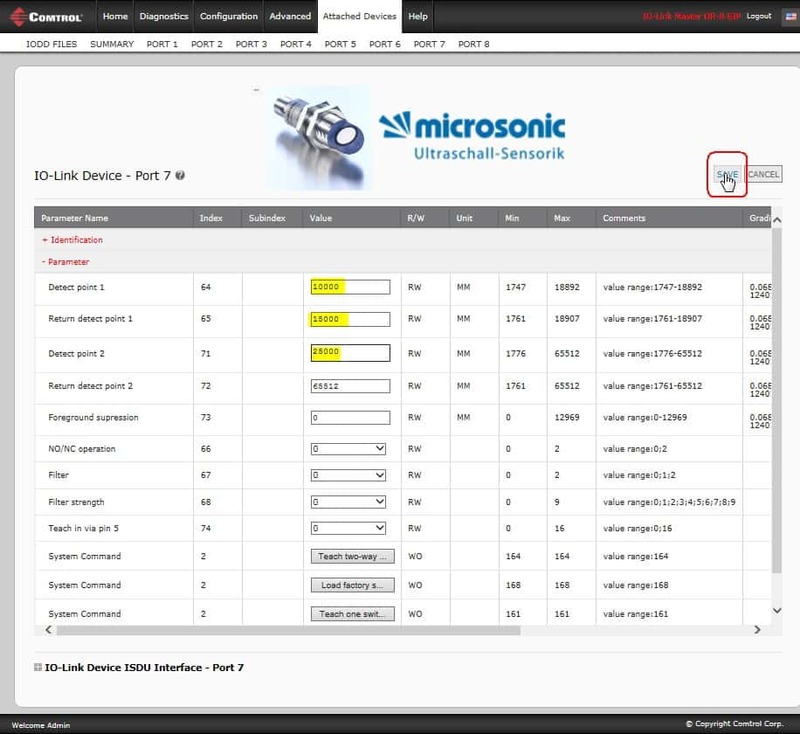 After uploading the IO-Link device manufacturer IODD files, easily and quickly configure IO-Link devices using the IO-Link Device – Port table, which provides ISDU handling. The IO-Link Device – Port table provides a GUI configuration interface between the IO-Link device IODD file loaded on the IO-Link Master and the IO-Link device. Click the Attached Devices | Port page for the IO-Link device and click the EDIT button to make changes to the device parameters. Make the changes and click SAVE. Click REFRESH to confirm the parameter changes. 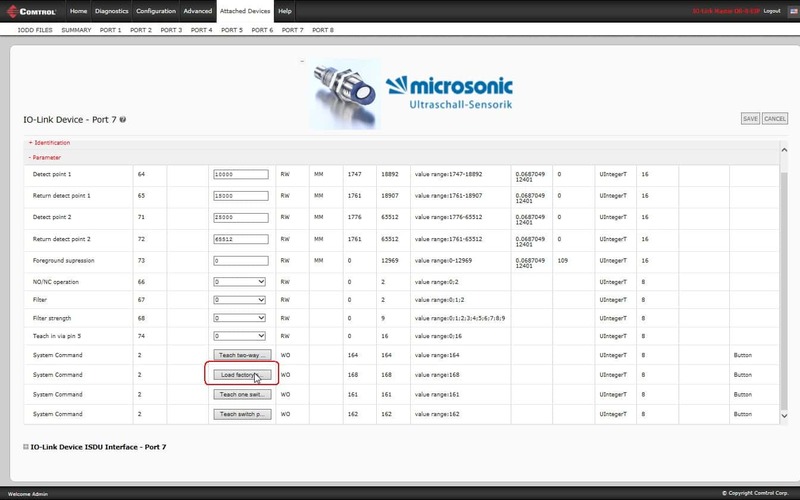 If needed, reset the IO-Link device parameters back to the factory settings. 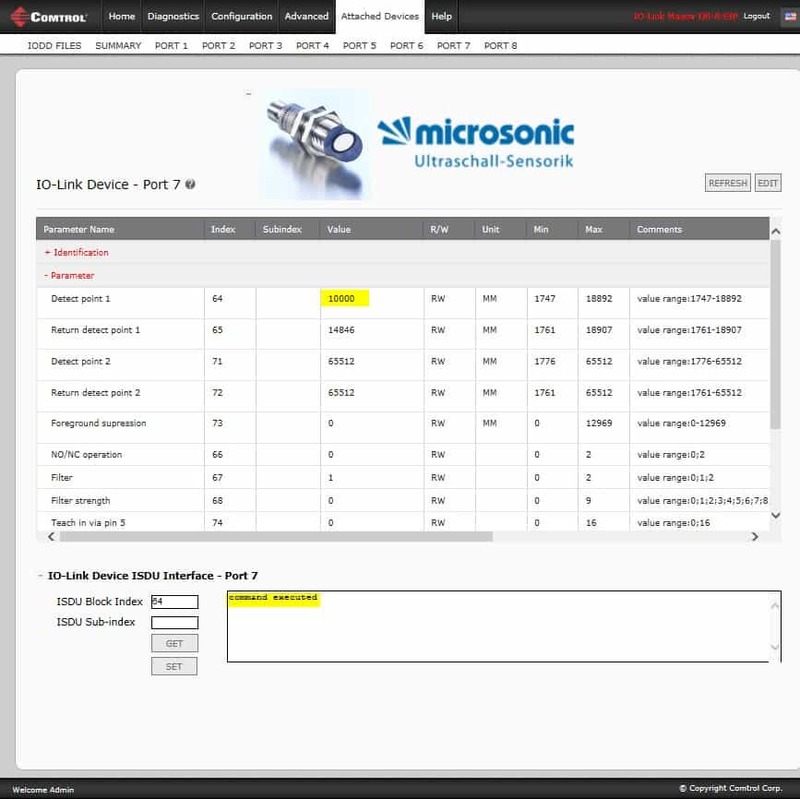 Optionally, configure IO-Link devices using the IO-Link Device ISDU Interface which provides ISDU handling and you can edit IO-Link device parameters whether the IODD file is loaded or not. Use the IO-Link Device ISDU Interface and the IO-Link Device Operators Manual to configure the IO-Link device. Optionally, you can load the IODD file to reference the ISDU Block Index numbers. This shows changing ISDU Index 64 to 10000 (27 10h). The IOLM responds with a command executed response if the parameter change fits a defined value. If the IODD file is loaded, you can verify the parameter changes by clicking REFRESH.